…to a GoodBelly Promo Event/GIVEAWAY!!! Last month I attended a promotional event for GoodBelly. GoodBelly is a Boulder-based company that produces a probiotic juice drink intent on replacing the bad bacteria in your body with good bacteria. With 6 pounds of bacteria in each of our bodies, it’s important that the good outweigh the bad for healthy digestion. Here’s a little video to catch you up on probiotics, your intestines, and how it all works for your best health. There you have it! And with over 10 juice flavors to choose from, anyone is bound to find the right one for their palate. Juices can be found through GoodBelly+, BigShot, StraightShot, and quarts. Most importantly, they are all dairy-free, soy-free, and vegan drinks. GoodBelly has been featured on the Today show as well as in Justin Timberlake’s fridge. So why isn’t in your fridge? Personally, this product really hit home. A great friend of mine is in remission for Colitis and GoodBelly has done wonders for those with Colitis or Crohns. They have even partnered with CCFA for a few of their walks in California. The wonderful thing about GoodBelly is that they offer a 12 day challenge. Try it for 12 days and they guarantee you will feel a difference! Or your money back! Now that’s a challenge worth taking! I just started mine and you should too! GoodBelly would love to do a GIVEAWAY on my blog for the 12 day challenge! 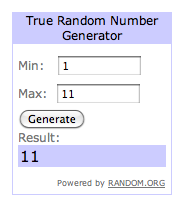 THE WINNER WILL RECEIVE A 12 DAY SUPPLY OF GOODBELLY! FREE! Please LEAVE A COMMENT telling me which flavor you’d like to try. This means you actually need to clickity-click on over to GoodBelly’s website. For an extra entry, TWEET about my giveaway! Just leave another comment letting me know you tweeted. And for a super extra entry, MENTION my giveaway on your blog and tell me you did so in the comments. The contest will end on Thursday and the winner announced on Friday! Categories: Connections, Product Review | Permalink. The lovely Courtney nominated me for my very first blogger award! Hard to believe, right, since I’ve been blogging off and on for the past 5 years or so (not always as The Blonde Runs). So this nomination is super special! Courtney is somewhat of a newbie in the running community, but her passion for the sport inspires me daily! 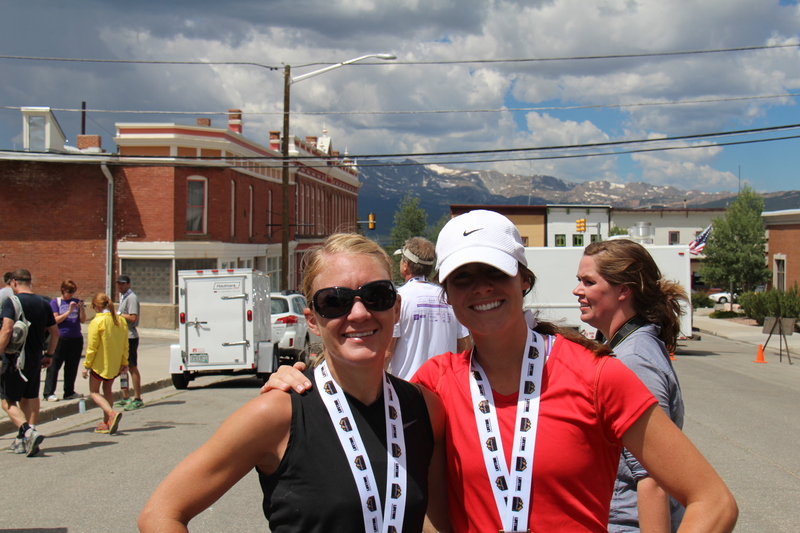 I got to give her a big hug at the Leadville Marathon and she is as cute in person as on her blog. C is authentic, compassionate, and a little firecracker! I love her spirit! Her blog is a great read! 2) I have 7 marathons under my belt. 2 of which were in Boston. I have only been marathoning since 2008. After each marathon I have said I never want to run another marathon again. That hasn’t turned out very well. 😉 At the moment, I have several marathons on my wish list. But, I’m looking at some different distances too. 3) I call myself a “quasi-Colorado native”, because I moved here when I was 5 years old. Colorado is one of the most wonderful places to live, in my opinion. I moved away briefly a few years ago to another beautiful place, but I ended up finding my way back to Colorado. I guess sometimes you don’t realize what you have until it’s gone. I do love our 300 days of sunshine! But, it would be nice if we had more water! 4) I was born in Louisiana. And sometimes “ya’ll” will slip out. I also credit my Cajun cooking to my Southern roots. I do love a good crawfish pie or gumbo. 5) I love to cook! I have a cooking blog that I don’t update very often. But every once in a while I’ll take a nice photo of something I’ve made. Maybe when I start posting more I’ll link to the blog. 🙂 I have fantasized about opening my own little cafe some day with a hodgepodge of my favorite things I like to make. But, doubtful. 6) When I’m really relaxed, my toes naturally “cross.” My big toe will cross over my 2nd toe and rest there peacefully until I look down and realize they did it without me knowing. 7) I love photography and wish I knew more about it. Until then, I turn dials and push buttons on my fancy camera hoping for the best. Every once in a while I’ll snap something decent. Sometimes those photographs show up here. The rest of the time they are the foggy photos from my iPhone. Okay, those are mostly boring. So for continuing to read, I’ll give you another little tidbit: I have a serious weakness for ice cream. There. The truth shall set you free. 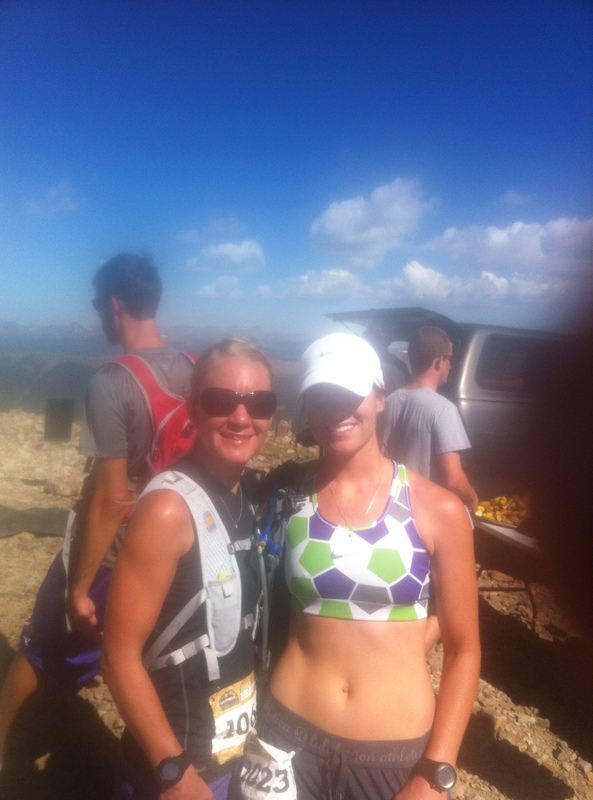 1) Chronic Runner Chronic Runner is a long time runner who knows what running in Boulder, CO is all about! She speaks honestly of balancing work and family life with her passion of running. CR is a climber, a coach, and is the mastermind behind The Kids Running Project. 2) Figuring It Out J posts some of the most beautiful photographs on her blog! 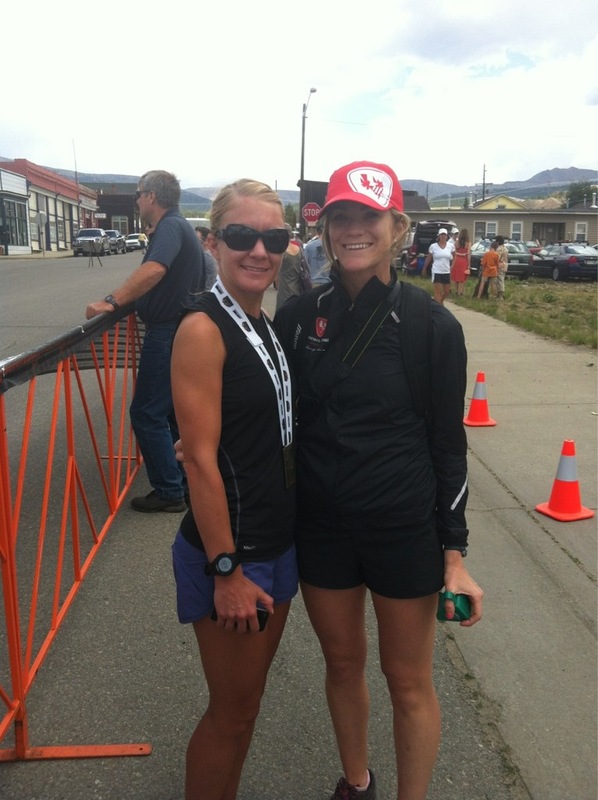 Based in Nova Scotia, J recently took on one of her biggest challenges yet: a 50k ultramarathon! 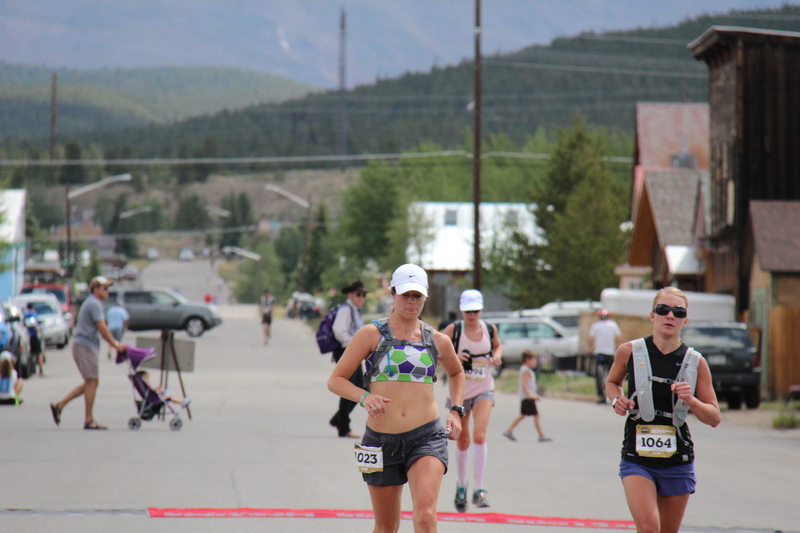 As a potential ultrarunner, I loved reading about her experience: from the training, to her pre-race thoughts, to her race report, J offers a realistic approach to running long. 3) LGSmash I just started reading LGSmash in the last year or so and I love her blog! I was able to meet her at a recent blogger meet-up in Boulder too; what a sweetie! LG loves fitness and loves her fiancee. 🙂 In fact, she is getting married VERY soon and often posts about her wedding planning experience. LG also writes about a joint condition she has that affects her knees and how she overcomes it. And she does so beautifully! 4) Meghan’s Wanderings I first met Meghan when I was living in Washington state. But it was after I moved back to Colorado and started blogging again that I realized she has a blog too! Duh. M is saucy and quirky and I love her photos that include her little finger puppets (Ragnar and Drunk Puppet). Oh yeah, and the banana suit. And the cupcakes. And heels. Go read. 7) Keith’s Odyssey Last but not least, another Canadian! I have been reading Keith’s blog for years. He is primarily a tri-er who completed Ironman Canada in 2010. Stud. He also writes a lot about yoga, his cats, Linda, and Canadian politics. With occasional rants. He’s really good for a care package exchange too. For those of you who want some good homemade cookies. Couldn’t convince him to send me a bottle of homemade wine. A huge shout out to my newest blog followers! I don’t know who you are, or where you came from, or how you found little ol’ me, but I’m so glad you did! I would be completely remiss if I didn’t say THANK YOU for following! Clickety-click. Go check them out. Maybe all this really means that I do have more than five readers! The boy, Erika, Danielle, and I headed up to Leadville on Friday night. 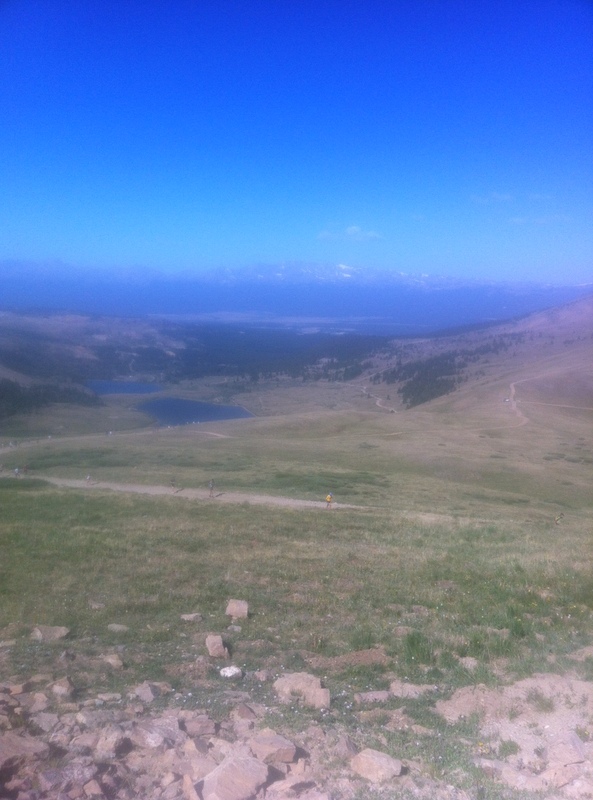 And I really do mean “up.” Leadville is the highest city in the USofA at 10,430 feet elevation. On Saturday morning, Danielle and I prepped as usual (or as best you can when you are camping) for the big race. We all rolled into town around 7am for packet pickup and eventually made our way to the race start. Danielle and I knew this would be a tough one, climbing to 13,185 feet at the top of Mosquito Pass. With nothing to prove and no time goals, we started the race at a slow, conversational pace. Of course, the route began on an uphill. And as you would assume, there really wasn’t much relief, save a brief mile or so down hill, before the final, brutal ascent. I had read that the average finish time for the half was 4h and 14m. So, I guess I was going for 4h and 14m. Or at least a minute faster. To be honest, I really had no idea what to expect. At least it was beautiful. We ran until about mile 5.5 or 6, when the only choice was to hike. Everyone was hiking. One of the best parts was watching all the frontrunners coming down the hill. Seeing the lead men and women was such a rush. They are some of the most encouraging people, too. Good job! You’re almost there! Keep it up! Nice job! It was like having a personal set of cheerleaders. You couldn’t help but to return the favor and encourage their pace and stamina. When we finally summited, at the top of Mosquito Pass, at 1h and 55m, it felt like a huge accomplishment. Now for the fun part and the faster part…downhill. The rock field on that last mile or two before the summit was hard enough to maneuver hiking up, much less trying to run down it, avoiding the runners still ascending! There were a lot of little slips and ankle rolls along the way. Once we finally made it past that part, I was beginning to feel queasy. I recalled the same feeling from a previous run I had not two months prior. Uh oh. I tried my best to keep my mind off of it. The hard part of this race for me were the final few miles. The small downhill we had on the way up (about a mile) was now an uphill on the way back. 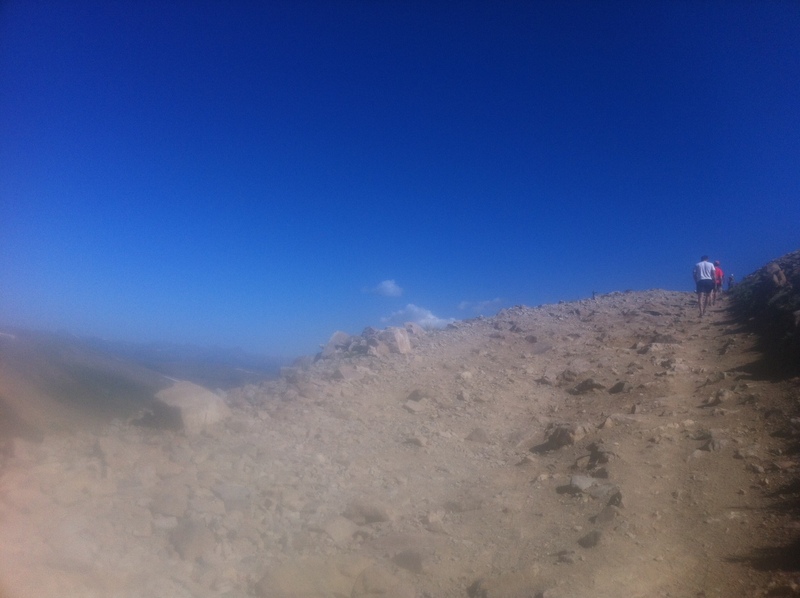 And although is was SO minor in comparison to the hike up to the summit, it felt much worse! Over 7 miles of uphill, followed by 5 miles of downhill, my legs were revolting. But I pressed on, each pink and black flag that marked the course were my points of contact. With only two miles to go, my stomach began to revolt. I knew I had been doing a lot of jiggling around, coming down the pass so quickly, but this felt mulitcolor yawn worthy. I tried to ignore it as much as I could, especially since I was now only a half mile from the finish. Finally, with just a few hundred yards to go, I had that feeling. That feeling that something is going to happen and you just can’t stop it. Since there were no porcelain gods on the course, I frantically made my way off the course to unswallow everything in my stomach (which wasn’t much). 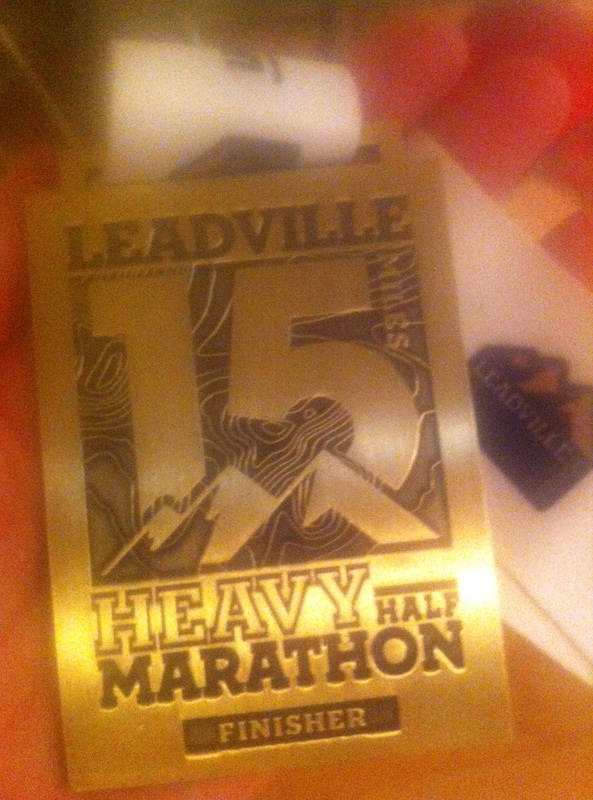 Sorry, town of Leadville. Naturally, not one to quit, I kept running and even passed someone on my way to the finish. Danielle and I crossed in 3:11. Before even getting my medal, I made my way to the side of the finish and wished there were trash cans there because I cried Ruth one more time. Sorry, Leadville. Now, I just feel like I owe the town of Leadville some community service. *Note to all Race Directors: PLEASE have trash cans at the finish line so queasy people like me, who can’t figure out why they are getting queasy all the time at races now, can vurp in a contained area, as opposed to streetside. After I assured the volunteers that I did not need a medic, nor a phone call placed on my behalf to 911, I cleaned up and laid down for a while. I’m lucky to have a boyfriend who isn’t totally grossed out when I readjust my fluids. Or if he is, he just doesn’t say anything, but helps me anyway. I really need to figure this out. Once I was feeling better and smelling better, sans the runner B.O., I returned to the finish to finally meet Courtney! What a cutie! With her lulu shorts and fancy camera and easy conversation, I knew I liked her right away. Can’t wait to run with her soon! She was waiting on her main squeeze who was running the full. This was a really tough course. Really. Not for the faint of heart. The incline alone was difficult; coupled with the elevation and this was a bear of a race. 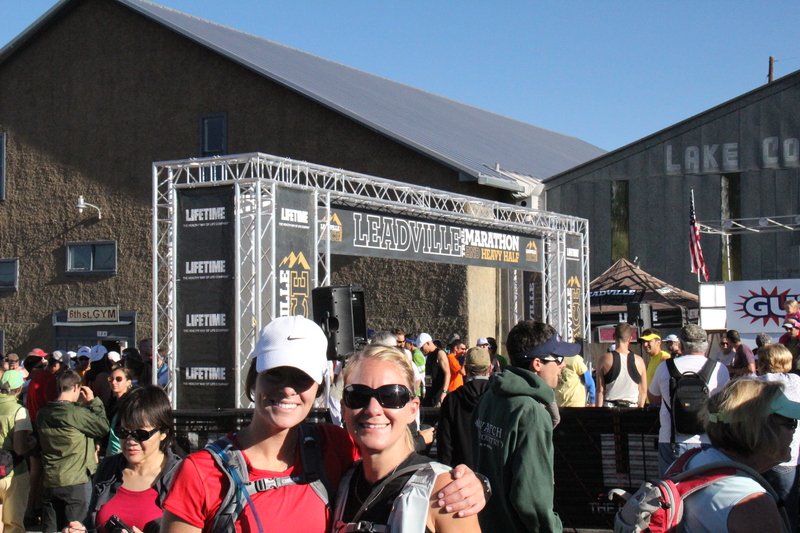 On one hand, I would love to do this race again, knowing exactly how to train now. On the other hand, I don’t ever want to do this race again! I would be completely remiss if I didn’t say a big thank you to all of the race volunteers. Everything was very well organized and the aid stations were well stocked with great snacks, plenty of liquids, and fabulous people! They were happy and encouraging and it felt as though they wouldn’t imagine being anywhere else! Because I had another half marathon the next day, I knew I needed to eat and take care of my legs. We headed back to camp to load up. Danielle would be going back to the Denver area; Erika, the boy, and I would head 2.5 hours north to Steamboat Springs, where I was looking forward to sitting in a hot tub. 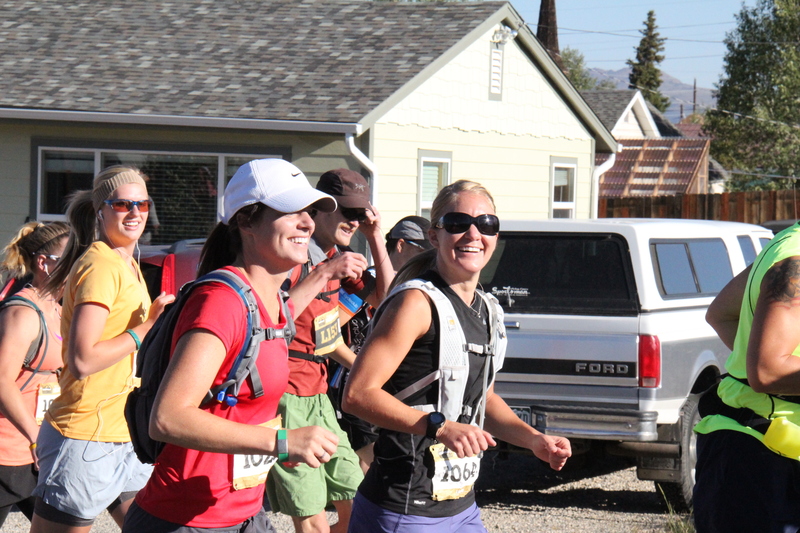 Next up: Steamboat Mountain Madness Half, the 2nd race of the weekend, and a huge bonk! Categories: Altitude, Connections, Races, Trail Running | Permalink.